Samuel Goldwyn Films opens That Sugar Film at Village East Cinema and on VOD on July 31st, 2015. Damon Gameau: It was probably one of the biggest challenges of making the film. We were constantly thinking about the audience and where would they be at this point in the story. There's a quote from Oscar Wilde: "If you want to tell people the truth, make them laugh, otherwise they kill you." That was what we were trying to do very well. There are so many documentaries out there that simply record. We wanted people to have a good time and be inspired. You don't have to wait for the government or food industry to do anything. You just go home, read the label and work out what to put into your body, and realize that what you're putting into your body is sugar. NYC MOVIE GURU: How did you avoid scaring children while not resorting to sugar-coating (pun-intended!)? DG: That's the biggest challenge that we had with the Mountain Dew Mouth scene because I needed to show what too much sugar can do to your teeth. We screened it for dentists and they said we have to put in that scene because we see, not just in our socioeconomic areas, children just like that. These are the stories that people aren't aware of. We were constantly thinking about whether it was too much for an audience, especially kids. NYC MOVIE GURU: How do you feel about the fact that medical doctors in America get so little education on nutrition (i.e. 9 hours of nutrition education during their 4 years of studying)? DG: That's a travesty. I think what's really happening is a kind of thinking that the doctor can solve the problem with medication, but really we have a lack of understanding about the important things about your health and well-being. What we're trying to raise awareness about is if you know what you should be putting into your body, you won't need the medications--if you're eating healthy food. 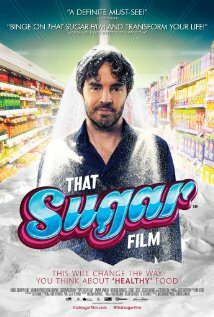 NYC MOVIE GURU: How important and challenging was it for you to find a balance of opinions in That Sugar Film? DG: If you go too extreme, that's not very interesting and not the way to go. If we can just get to the WHO's recommendation of daily sugar recommendation, 25 grams, then there'd be an enormous change in people's health. We're just giving people information and letting them have the free choice---it's your choice. But at least you know what a lot of sugar does to the body and the mind. NYC MOVIE GURU: Speaking of balance, how did you persuade the Coca-Cola-funded scientist to be in the film? DG: He was very happy to talk about that topic because he genuinely believes what he's saying. As we know, it's just another level of manipulation and ambiguity that the industry puts out there. NYC MOVIE GURU: Food and drugs are regulated by the same administration in America. That sound like a conflict of interest. Do you agree? DG: I could not agree more. We reached a point now, especially with the foody supply, that we need maximum integrity. There are so many studies that have come out recently that show that when a study is funded by the food industry, the results are manipulated---something has to be done about it. It's actually killing people. Even if they're not doing anything--the fact that they're linked raises a lot of questions. The sooner that we can have an independent body, the better. Unfortunately, there are people who are not trusting corporations. We need independent agencies so that people, especially parents, can know absolutely that there's integrity. The sooner we can change it and get a little truth in there, the more healthier we'll get very quickly. NYC MOVIE GURU: If you were in charge of a regulatory agency like the FDA, what kind of changes would you make? DG: I would make companies accountable for what they put in front of their packages. They can't say "Packed with essential Vitamin B" or "Full of Vitamin A and energy" if that product has a lot of sugar in it. Even some of the imagery is deceptive. They shouldn't put images of nature because it's very misleading. The other word you see a lot these day a lot is "Gluten-free." People think that just because it says "Organic" and "Gluten-free," they should buy it, but again we need government regulation there because people are confused. If it says "Organic", "Gluten-free", and "MSG-free", then it better be true because people are putting their lives at risk. A lot of people are eating these foods thinking they're eating the right things, but we need companies to be held more accountable and say, "You know what? A lot of these foods have as much sugar as junk foods." People are just not aware of that. We needed clearer labeling of how much added sugar is in our food, and what kind of sugar is in our products. No one really knows what 20 grams or 40 grams really means. If they would say something like "16 teaspoons" instead, that would be much more visceral and real for people because they've got something to relate it to. Then they can make well-informed decisions whether or not to give it to their children. NYC MOVIE GURU: How did you manage to differentiate and get more attention for your film given that hundreds of documentaries are released each year? DG: Right from the beginning when I was making this movie, I was adamant that I didn't want this film to just be seen by film people at festivals like Sundance or Cannes. The challenge is always, "How do we get this film seen by people that need to see it?" Most people don't watch documentaries. So, how do I make it appealing to children and have it be really broad and commercial? I tried to push the boundaries by using animation and make it fun and playful. I went after people like Hugh Jackman and Stephen Fry to get that kind of star power so that people who might not go to see it would. In Australia, instead of just releasing it in general release in one day, we did a tour of the country with the film. We did Q&As and special panels with nutritionists. There was fantastic discussion. We made it into an event where people can really talk about the topic and hear stories about their children. Last week, we became the highest grossing documentary in Australia, so it's worked: the message has gone out there, and people are going to the cinema and buying the DVD. DG: It's not just MSG, but also other things that are popping up about foods. Usually, what it comes down to, is processed foods. If you can try to keep the processed foods down and eat real, whole foods, you're going to avoid too much sugar, too much salt and you're going to avoid too much MSG because that're really where the problem lies. NYC MOVIE GURU: What documentaries would make for a great double feature with That Sugar Film? DG: The Staircase, one of my favorite documentaries. Also, Food, Inc. is one that everyone needs to see. NYC MOVIE GURU: What about a non-documentary double feature? DG: Mad Max: Fury Road.